Some users have discovered they can't send sharing invitations when they right click on the calendar or contacts folder in their mailbox and choose Share, Share [folder]. "Folder sharing is not available with the following entries because of permission settings on your network." This happens when the user picks the recipient's name from the autocomplete list. The entry in the autocomplete list contains the SMTP address, not the Exchange x.500 information from the Active Directory, so Outlook thinks it's an outside address and denies it. Delete the recipient's name when it comes up in the autocomplete list and select it from the Global Address List (GAL) instead. Sending the sharing invitation from Outlook on the web should also work. If it fails in Outlook on the web, check the sharing settings in the Exchange Admin console. Sharing the calendar won't automatically give the person you are sharing with the permission to view the calendar. You'll need to give them permission before you share the calendar, especially if the default permission is set to None. To do this, right click on the Calendar and choose Properties. Click Add, select the person's name and assign permissions. 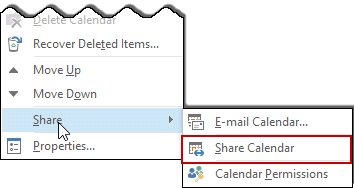 Sharing an Exchange Server Calendar with Customers? Wow, worked just like you described. Wish all Microsoft "features" could be fixed so easily!! Your points really help me understand why outlook reject to open the folder. I change the DNS to google DNS then it worked. Thanks so much, this worked for me. But, as I mentioned, it appears that I am passed the permissions level issue. Are you saying that message "error while preparing to send..." is generated because of permission restrictions--? I have no issues when sharing my Calendars, only "Task" folders. the cause and solution should be the same for any folder type - they need to have permissions and you may need to remove their name from the autocomplete list. Thank You! This fixed our issue. I love easy fixes. Are you all using the same version of Outlook? Are all updates installed? How is the person opening the folder in their outlook? (Using Open other users or as an additional mailbox).